Are you a fan of the smash TV hit, Duck Dynasty? 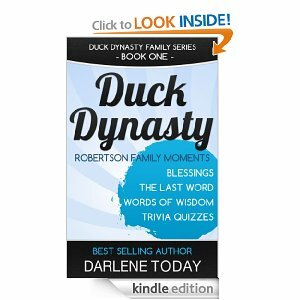 Then check out this freebie — Right now, you can get a FREE download of the eBook Duck Dynasty Robertson Family Moments by Darlene Today (see link at bottom). This 274 page book contains episode summaries from seasons 1,2 and 3 along with trivia, Phil’s nightly blessing, and Willie’s words of wisdom. Amazon ebooks can be read on a Kindle device, computer, smartphone, tablet or anywhere with the Kindle Cloud (click here for more information). Make sure this is still free before you checkout. Amazon often changes the prices on the ebooks.